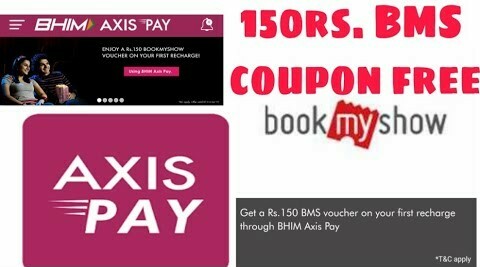 BHIM Axis Pay – Get Rs150 BMS voucher on your first recharge through BHIM Axis Pay. On successful recharge, get a Rs. 150 BookMyShow voucher through SMS within 7 days of the transaction. On reciept of voucher Log on to in.bookmyshow.com or BookMyShow Mobile App. No Minimum Recharge Required . Hurry up!! How to Get Rs 150 BMS voucher on your first recharge through BHIM Axis Pay? 4- On reciept of voucher Log on to in.bookmyshow.com or BookMyShow Mobile App. 5- Select Location, Event, Venue, Show Date, Time & Seats of your preference as the logicflows. 6- On payment page, click on the “More Payment Options” & click on the “Gift Voucher” tab to enter the Gift Voucher e-code in the text box that appears & click on “Apply” button to avail the offer. 4. This offer is non-transferrable to any other person and cannot be exchange with any other offer. 5. The offer is not transferable, non-assignable, non-negotiable and cannot be en-cashed or clubbed with any other offer of Axis Bank. 7. BMS Gift Voucher can be redeemed only on BookMyShow Website/Mobile App and cannot be redeemed directly at the Cinema/Venue Box Office. 8. BMS Gift Voucher can be redeemed on purchase of etickets for Movies/Plays/Concerts/Sports Or Merchandise (if any) available on BookMyShow. 9. Gift Vouchers to be valid for 3 months. 10. Customer can only avail this offer once per unique mobile number. 11. In all matters relating to the offer and these terms & conditions, the decision taken by Axis Bank BMS will be the final decision, which will be binding on the User.